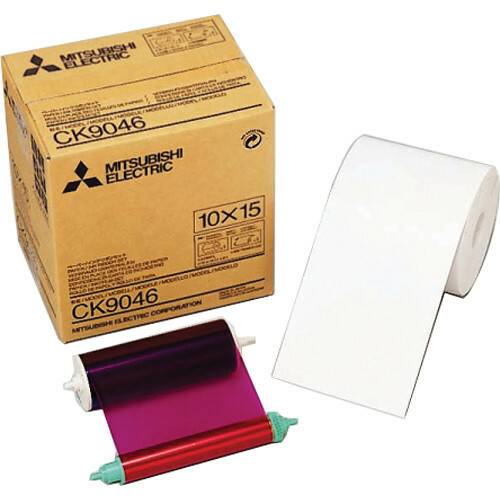 Print Size: 4 x 6"
3.5 x 5" 4 x 6" 5 x 7" 6 x 9"
The 4.0" Paper Roll and Inksheet is designed for the CP-9550DW Dye-Sub Printer and yields 600 prints. Box Dimensions (LxWxH) 10.35 x 10.15 x 6.95"
4.0" Paper Roll and Inksheet is rated 5.0 out of 5 by 2. Rated 5 out of 5 by Photographicedge from Perfect,perfect,perfect I use this paper for my photo booth. Great price and product was just as described,Super fast shipping and packaged professionally. Rated 5 out of 5 by John from A roll of paper and a roll of dye film Reviewing this item is silly - if you have a compatible printer, not only does it work just fine, it's pretty much the only option that will work at all. If you don't have a compatible printer, it won't work at all and you should stop looking at this item. I use this paper in the Mitsubishi CP-9550-DW. Note that certain photobooth manufacturers (Digital Centre) modify that printer so only media sourced from them will work (at a premium, but no new functionality or better quality, just a vendor lock in). If you have one of those systems, changing that "Feature" means having the motherboard of the printer replaced (which will then make it incompatible with the Digital Centre booth hardware). One of my printers came from Digital Centre but is used in a different system - after the motherboard swap ($200) I can use this paper. In 3 rolls I saved enough on media that I broke even on the MB swap. BH does generally have it in stock and delivers pretty quickly, so that's cool.